Spanish Colgate Figures List? Rarity? Thread: Spanish Colgate Figures List? Rarity? 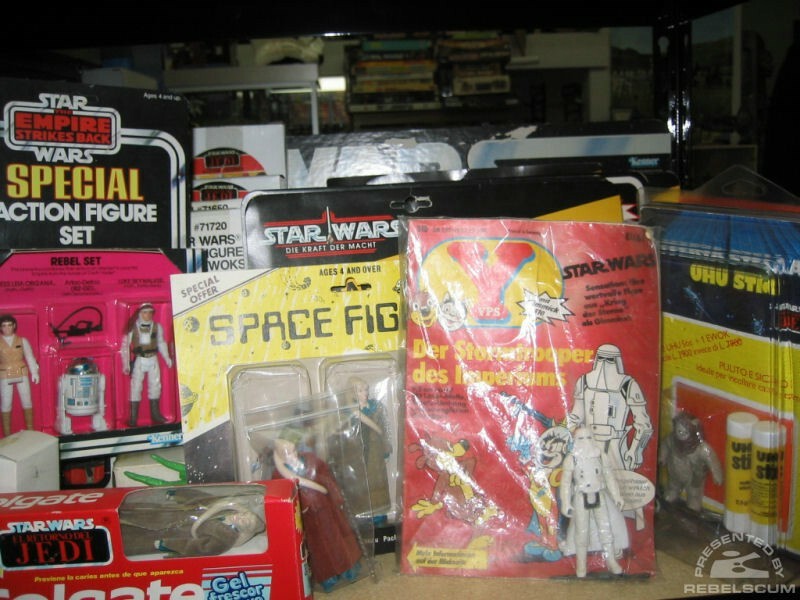 I have been wondering for a while about the Spanish ROTJ promotion where figures were given away w/ tube of Colgate. I would imagine these are pretty rare--but are they Vinyl Caped Jawa rare or Vlix Hardcopy rare? Does anyone have list of what figures were included or an idea of value? I would like to add a couple of these to my ROTJ collection. Re: Spanish Colgate Figures List? Rarity? I would imagine these are pretty rare--but are they Vinyl Caped Jawa rare or Vlix Hardcopy rare? More like Vlix HC rare. Does anyone have list of what figures were included or an idea of value? I asked this same question YEARS ago and didn't get an answer and this one shouldn't be much better. As for a list, there is a Biker Scout pictured in the Tomarts and I'm not sure anybody even knows whose that one is/was and there's a Bib that is pictured every place else but it's all the same Bib and it belongs to Sansweet. I've never seen or heard of another and people have been asking about these for years. I would like to add a couple of these to my ROTJ collection. A couple? I wish you luck even finding one. I first enquired about 7 years ago and in that time not only have I not heard of one selling I've not even seen one turn up or even seen or heard of one locked in a private collection (aside from the two previously mentioned that have been known about for a while now). Some more pictures of the Sansweet piece can be seen here. WOW--I had no idea. It looks like I have new holy grail to seek out! It seems according to Kim that it was starbeanie that owned them. I don't remember Bret ever confirming that though. I am 200% sure that I had a bikerscout and one other back in the eighties they were bought by my grandparents who stayed at Benidorn (spain) for few months every year! I have a dozen of dia's and on one of them are my first star wars figures. at one picture there is darth vader, atat commander, luke hoth, biker scout. they brought back 2 toothpaste packages and one of them was the bikerscout 200% sure so the other package has to be one of the other atat commander/luke hoth or darth vader. We shall flow a river forth to thee, and teeming with souls shall it ever be. In nomine patris, et filii....et spiritus sancti. The last figure in the image I cannot make out at all.